Sometimes we can’t able to go through your journey and we want to cancel your tickets. As we cancel a ticket, Indian Railway imposes a certain amount, which is either based on a flat rate of IRCTC cancellation charges for train tickets or a percentage of amount deducted from the cost of a ticket as a cancellation charges. The cancellation charges will remain same whether we book your tickets through IRCTC website or any other travelling sites. One of the great services launched by Indian Railway is cancellation of railway tickets online. IRCTC cancellation charges for train tickets is imposed as a part of IRCTC service charges for the train tickets booked through IRCTC website or any other website connected with IRCTC. We can only cancel the IRCTC tickets before the chart preparation, the train chart is prepared before the 4 hours of actual time of journey. Tickets cannot be cancelled once the chart is prepared. But when the ticket is not confirmed, we will get the full refund amount of the ticket as per existing rules of service deduction charges. Generally IRCTC cancellation charges for e-tickets depends up on the status of ticket, class of the tickets, date and time of journey, distance of the journey and duration between the cancellation of railway tickets etc. Standard Cancellation Charges per passenger are applicable for the tickets, which are cancelled within a day (i.e. 24 hours) or more in advance than the date of journey. The following charges are deducted for cancellation of ticket. Cancellation charges for IRCTC ticket cancelled in less than 24 hours of scheduled departure until chart prepared. 25% of the fare subject to the minimum flat rate mentioned in the above clause. A flat rate of 25% is deducted from the total cost of the ticket in addition to minimum cancellation charges for train tickets, if the confirmed ticket is cancelled within 48 hours and upto 12 hours before the schedule departure of the train. A flat rate of 50% is deducted from the total cost of the ticket in addition to minimum cancellation charges for train tickets, if the confirmed ticket is cancelled within 12 hours and up to 4 hours before the schedule departure of the train. If the departure and chart preparation of the train is less than 4 hours, then No Refund is given on cancellation of confirmed tickets. Yes. We can cancel tatkal tickets also, but no money is refunded when we cancel the confirmed taktal tickets. The total amount which we paid for booking the tatkal tickets is treated as cancellation charges of e-tickets, for confirmed taktal tickets. 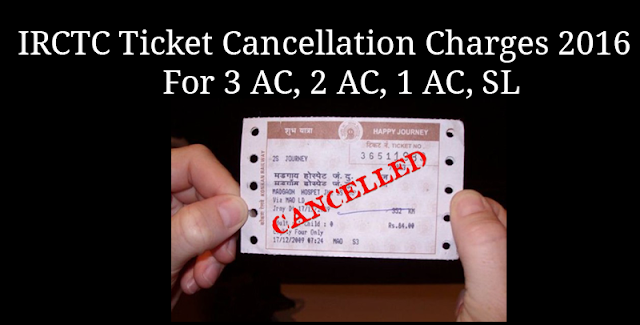 Wait-List tickets or RAC tickets cancellation charges – No cancellation charges for railway tickets are applicable, if your ticket is not confirmed and is under RAC or Wait-Listed ticket status. But clerk-age charges is deducted from the cost of the ticket and balance amount is refunded to the bank account or credit/debit card. But what are actually Clerk age charges and when it is imposed ? Clerk age charges are imposed for the clerical work performed in refund of amount on cancellation of unreserved, RAC and Wait-Listed tickets. The amount of clerk age charges are as follows. Even though we can book I-tickets on online, but they can’t be cancelled online. If we want to cancel an I-ticket then we should visit a computerised reservation centre printed copy of the ticket. The refund amount will be transferred to the respective bank account or credit/debit card from which the payment is made to book the tickets, after deducting the cancellation charges. No cash refund is provided to the customer at the reservation centre. I-tickets can be cancelled at the reservation centre before 4 days (i.e. 72 hours) of scheduled departure of the train. We can’t cancel I-tickets between 72 hours and scheduled departure, even when the ticket is confirmed. 1. What if I didn't cancel my RAC ticket and not traveled also. Can I get the refund and what will be the cancellation charges ? >>For RAC tickets 30 Rs. per passenger will be deducted as cancellation charges in IRCTC, if you have filed the refund request. The RAC tickets should be cancelled within 3 hours of train departure and refund request also be made within 3 hours of train departure. If you don't file a refund request, no refund will be provided. 2. Will I get refund on services charges imposed while booking the tickets ? >>No, you cannot get refund on services charges imposed while booking a IRCTC tickets. As this charges are levied by banks and the payment gateways. So the amount will not be refunded to your account. #If you have any questions or queries after thoroughly going through the IRCTC Ticket Cancellation Charges 2018 for 3 AC, 2 AC, 1 AC, SL post content, you can leave them in the comments section below and they will be answered with the best information available. The cancellation charges are very high and abnormal. Irctc exploiting passenger at every possible way. It is injustice. What is the process of cancelation of refund, if chart has been made but still 5 hrs is pending for departure the train from the station.